Ah! Anime Central once again! I never heard how many people they had this year, but it was a LOT!! And the packed to the gills main event hall showed it during the cosplay Masquerade and competition. Once again, the Gung Ho Otaku entered. Our series to cosplay this time; X. The idea; "Weekend at Kakkyou's." Now, if you know who Kakkyou is in the series, then you're already on the floor laughing. If you don't, all you need to know is that he spent most of the series unconscious. I can't take credit for this idea. That rather dubious honor belongs to Gung Ho Otaku member Joseph Barrington. The guys got to deal with carrying around the unconscious Kakkyou while us girls each got to have a sight gag. Yuzuriha had an invisible dog leash. Kotori randomly had the Kamui wings, and my Arashi had had her sword superglued to her hand. I was assigned to play sword weilding Dragon of Heaven Arashi Kishou. 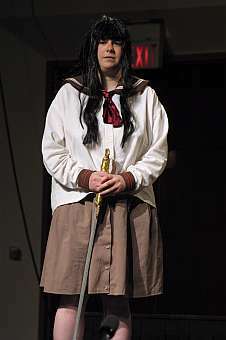 The costume parts started life as a longer skirt and a white button-up shirt obtained at the local Goodwill store, a fright wig from a costuming store, and some brown fabric and red braid. I hacked off and re-hemmed the skirt. The brown fabric and red braid, through much toil, was turned into the collar and sleeve cuffs on the shirt. To get the right look on the trim, I ironed some scraps of white fabric into some bias tape and sewed it on. The red braid went on top of that. Taking a pair of scissors to the wig styled it to the right shape (I'm reminded why I don't let my real hair have bangs, though). The sword was the most complicated endeavor. I cannibalized a prop sword from a previous Ring Game for the piece of wood. Using a hacksaw, I cut off a curved shape from one of the corners to give it that "katana" look. Then, the piece of wood was sanded and shoved into a piece of cardboard tubing to make the base for the hilt. The whole thing was then spray painted silver. Once the paint dried, I covered the hilt with tin foil and also used tin foil to make the rest of the shape (the pommel, the shape along the beginning of the blade). The ends of the hilt were then painted gold using stencil paint. As that would have rubbed off where my hands went, the rest of the hilt was then covered in gold ribbon. Elmer's woodglue was used to make various bits of the hilt behave itselt and hold its shape. All in all, the sword followed the 20-foot rule, but that was all it needed to hold up to stage scrutiny. 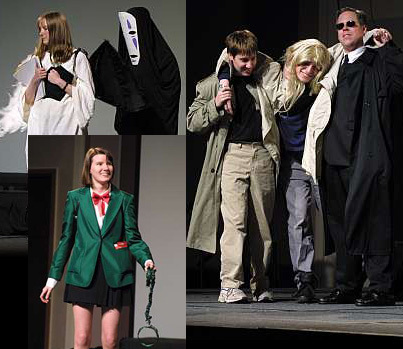 The other Gung Ho Otaku members who participated in the skit were Joseph Barrington as Kakkyou, Dave Hogle as Subaru, Matt Anderson in his Gung Ho Otaku debut as Seishiro, Deanna Morrison as Yuzuriha, Carolyn Hays as Kotori, and Robert Laib as NoFace. Once again, we didn't win anything, but our skit went over even better than last year and once again, we had a lot of fun. Fast Facts: This skit involved the largest Gung Ho Otaku group to date. Also, Anime Club of UW Madison sent a record number of people to the con as a whole. This marked the second year in a row where we had issues figuring out the interchange from I-90 to Manheim Road (which seems to be a normal thing for more people than just us, hence the line in the skit). It also marks the second year in a row that Joseph has had car troubles. It should also be noted that despite this being an X skit, we had neither a Kamui nor a Fuuma. Also worn by me was my Dijiko costume from NoBrand Con and a hastily thrown together "Convention Survivalist" outfit using a green army combat jacket. Also I shout out to DUCT TAPE BOY!!!! This page was created on 6/8/03 by Berzerker_prime.